In Delia Smith’s Book of Cakes she writes: “A cake is a symbol of love and friendship – if someone actually goes to the trouble of baking a cake specially for family and friends, they can’t fail to feel spoiled and care for”. I’ve always loved baking. Friends, family and colleagues have all been willing tasters over the years. Some friends encouraged me to start selling home made cakes and I sold my first cake at the end of November 2010. I also love learning the Welsh language and, when thinking about a name for the website, I wanted to reflect this, so I chose Teisen Deg, which means ‘fair cake’. 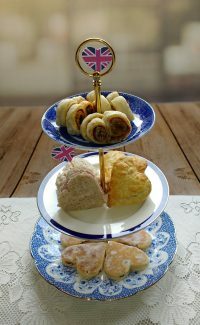 In 2014 I set up an afternoon tea delivery service in conjunction with the charity Vintagehope.co.uk. We have had the pleasure of providing afternoon tea for Yr Hen Lyfrgell in Cardiff city centre when they held their Open Day in February 2016; Wendy Hopkins Law Firm; Genesis Biosciences; Llanedeyrn Primary School and North Cardiff Orthodontic Centre, to name a few. WaterIoo Gardens Fete, Penylan in July 2015. This event is held every year to raise money for three local charities. It was an a wonderful afternoon, during which I sold around 300 portions of cake! Ichi Artisan Market, Pontcanna in November 2018. At this stall I also sold knitted and crocheted gifts and accessories by my recently established sister company, Handmade by Jayne. In June 2019 I am planning to have a stall at the Cathays Compass event outside St Monica’s school, which I am very much looking forward to. 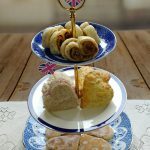 This website contains a selection of home made cakes which are most requested by customers, together with some new cakes that you may not have tried before. If you have a particular favourite that isn’t included here, please let me know. Please select a category under FIND A CAKE! in the right hand side bar to see information about home made cakes from Teisen Deg. Allergy Information: please ring to discuss product ingredients before placing your order. Sample Cakes: if you are considering placing a large order, say, to cater for a cake reception, you may wish to “try before you buy”. Boxes of sample cakes can be purchased for £5.00 each and will contain approximately 5-6 portions from a selection of cakes available at the time of your request. Please note: unless otherwise stated, prices exclude cake boards, boxes and decoration. Delivery charges apply.